There is no silver bullet, and some of the advice out there can do more harm than good. Post after post (and course after course) appears telling you the inside edge, the best method, the secret process, and some of them, maybe even most of them, may very well have some merit. But when does the quest to have the most marketable book detract from the quality of your story? Yes, there are certain tricks on timing and structure that can help (especially if you want to write to the formula so prevalent in YA and various genres). Yes, conforming to these can help you sell books. 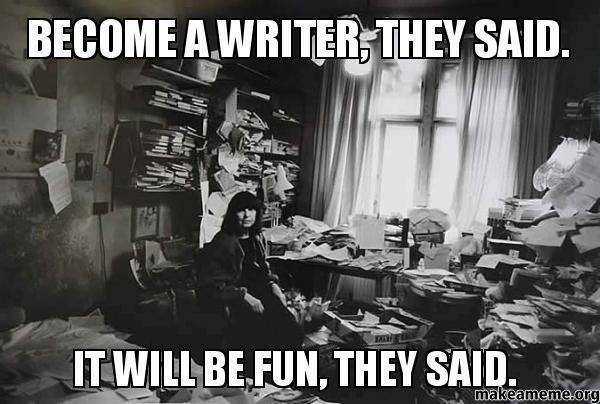 But that begs the question, am I writing to sell books, or to tell a story? Like it or not, as an aspiring writer you are a potential consumer. In today’s blogosphere, there’s a legion of unpublished souls, the greatest potential army of quill-wielding warriors in history, only an electronic step away from being published. That’s a big potential audience, a big market that a lot of people have been tapping into. It feels like there is a lot more money in telling people how to write than in actually writing. Now I’m not saying you should skimp on the basic structure and craft of the written word. If every sentence starts with He/She, that needs to be fixed. Your format, spelling, and font, need to be consistent. Grammer is essential, typos should be rooted out, and excessive repetition of words should be fixed with a bit of creativity and possibly a thesaurus. You should have a single PoV per scene, you should have a recognisable protagonist or two, and a not-excessive number of secondary characters. There is so much writing advice out there, and most of it can be great, but nothing is one-size-fits-all. So MY one-size-fits-all advice is this, once you master the basics, once you are comfortable in your own skin and know your own story, then seek out the experts in the genre you want to write, and see what they say. When you do, pick only a handful of sources and even then you have to be careful that you don’t mix in advice that actually works against you. Find a style, perfect that style, and remember that not everyone’s advice will be right for you. When your slow burn story gets trimmed to fit in the rising conflict necessary to adhere to the YA template, you have to stop to consider if this actually adds to your story. If you cut every adverb, twist every instance of passive voice, and shave every description to deliver a leaner, meaner, manuscript… you need to look at what you lost in the process. You also have to consider whether to write for the market or if you need to change your target market to match what you have written. Tagged: do you write for a market or market for what you have written, exposure is king, one size does not fit all, the octopus is our friend, to thine own self be true. ‹ What are the basics of novel structure?